Recently, I read the following words on the topic of waiting on God. I wish I could tell you who wrote them, but I have not been able to confirm this. However, they have encouraged my heart and I want to pass them on to you this week. Please enjoy! Waiting on God is not the suspension of meaning and purpose. It’s actually a part of the meaning and purpose that God has brought into my life. Waiting on God is not to be viewed as an obstruction in the way of the plan. Waiting is an essential part of the plan. 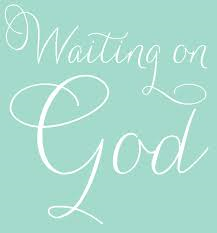 For the child of God waiting is not simply about what I will receive at the end of my wait. No, waiting is much more purposeful, efficient and practical than that. Waiting is fundamentally about what I will become as I wait. God is using the wait to do in my and through me exactly what He has promised. Through the wait, He is changing me. By the means of the wait, He is altering the fabric of my thoughts and desires. Through the wait, He is causing me to see and experience new things about Him. And all of this sharpens me, enabling be to be a more useful tool in His Redemptive Hands! More and more I am learning this…God alone supplies the grace to wait well…and what I gain is more of HIM….which gives me more opportunities to shine for HIM!